Feeding birds can be a fun and rewarding backyard hobby. Whether you're just getting started feeding birds or have been offering birdseed for years, these ten tips can help you attract more birds and keep every bird that visits happy, healthy and well-fed. Sunflower Seeds: If you offer just one food, make it sunflower seeds. These seeds offer high-calorie nutrition birds need and they appeal to the greatest number of species, from sparrows and finches to grosbeaks, buntings and doves. Diversify: If you can offer more foods at your feeders, present a wide range of choices to appeal to different birds. Different seeds – sunflower, millet, cracked corn, safflower – are a good start, but also add nuts, suet, fruit, nectar and jelly for birds to enjoy. More Feeders: As more birds discover your backyard buffet, their territorial nature can lead to aggressive confrontations as individual birds protect the food they see as theirs. To minimize competition and attract even more birds, use several feeders throughout the yard. Different Feeder Styles: Different birds feed in different ways, and using several types of feeders can accommodate many more birds in the backyard. Open platforms, hoppers, tubes, mesh feeders, cage feeders and other styles will all suit a variety of hungry birds. Keep It Clean: Just as dishes need to be washed, bird feeders need to be cleaned regularly to minimize residue, odors and bacteria that can be harmful to birds. Ideally, brush feeders clean every time they are refilled, and give them a thorough cleaning at least once a month. Refill Regularly: While backyard birds do not get the majority of their food from a single feeder and they will not starve if a feeder goes empty, a reliable feeder will attract more species more consistently. When feeders are empty, refill them promptly to keep birds visiting. Feed Year-Round: It is a myth that feeding birds in fall will keep them from migrating – in fact, migrating birds need the pit stop so they can refuel along their journeys. By feeding birds year-round, you'll enjoy more species and learn more about your local birds. Offer Natural Foods: In addition to feeders, provide natural foods with berry bushes, fruit trees, grass seeds and both seed-bearing and nectar-rich flowers. Birds love these natural foods, and you'll save money on birdseed besides. Keep Squirrels Away: Squirrels, chipmunks and other backyard wildlife love an easy meal and can severely damage bird feeders as they try to get the delicious seed. Use baffles, mesh cages and other techniques to discourage squirrels so birds don't go hungry. Protect Feeders: Birds are vulnerable when feeding, and all backyard birders should take steps to protect feeders from poor weather and predators. Using wide baffles can shelter feeders and keep predators away, and providing nearby shelter such as a brush pile can give birds a safe retreat. 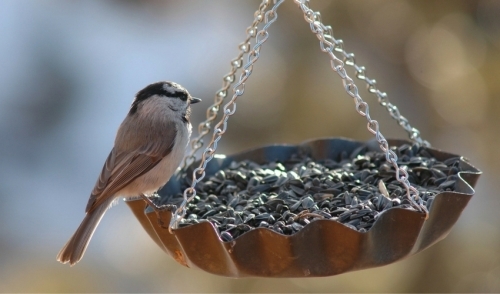 Whether you have just one feeder or can barely fit another one in your yard, use these tips to make the most of all your backyard bird feeding! © 2019 Plymouth Nursery. All rights reserved.